These meatballs are really satisfying and disappear pretty quickly! I have used ground turkey & chicken and both are equally delicious. Don’t skip the sauce… it is a must. Serve warm or at room temperature (or eat them cold out of the fridge like me). Preheat the oven to 400F. To prepare the peppers for the sauce, quarter them with a sharp knife and shave off the white parts and the seeds. Put them in a roasting tray and toss with 2 tablespoons of the olive oil and ½ teaspoon of the salt, then roast in the oven for 35 minutes or until soft. Transfer the hot peppers to a bowl and cover it with plastic wrap. Once they have cooled down a little, you can peel them, although it isn’t essential for this sauce. In any case, place them in a blender or food processor with their roasting juices and add the rest of the sauce ingredients. Process until smooth, then taste and adjust the salt if necessary. Set aside. 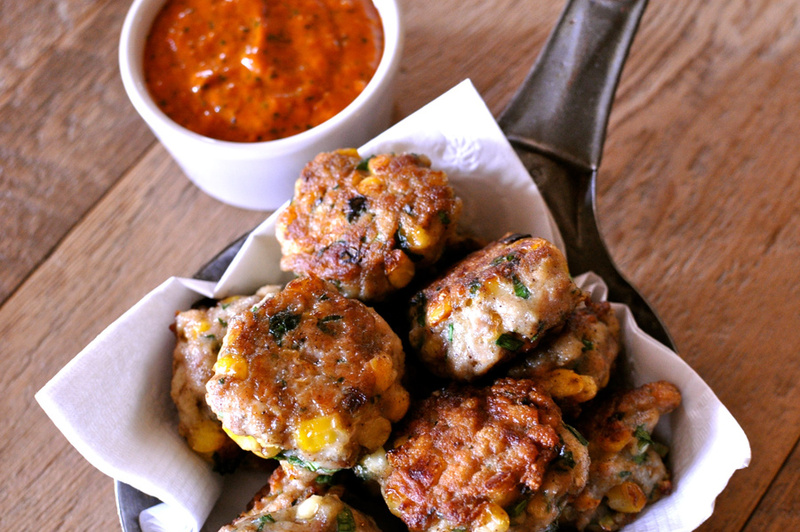 For the meatballs, place a heavy non-stick frying pan over a high heat and throw in the corn kernels. Toss them in the hot pan for 2-3 minutes, until lightly blackened. Remove and leave to cool. Soak the bread in cold water for a minute, then squeeze well and crumble it into a large bowl. Add all the rest of the ingredients except the oil and mix well with your hands. Pour a shallow depth of sunflower or canola oil into your heavy frying pan. Allow it to heat up well and then fry about a teaspoon of the mince mix in it. Remove, let cool a little and then taste. Adjust the amount of salt and pepper in the uncooked mixture to your liking. With wet hands, shape the mince mix into balls, about the size of golf balls. Brown them in small batches in the hot oil, turning them around in the pan until they are golden brown all over. Transfer to an oven tray, place in the oven at 400F and bake for about 5 minutes. When you press one with your finger, the meat should bounce back. If unsure, break one open to check that it is cooked inside. Serve hot or warm, with the pepper sauce on the side. 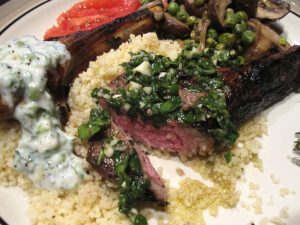 Lamb chops two ways… both extremely delicious. My dinner date & fellow foodie, Scott, was the master of these two sauces and he preferred the marriage of the two. I can’t seem to move beyond the Chimichurri. Chimichurri is Argentina’s pesto… and I’m becoming obsessed. I can’t think of anything I don’t want to put it on: fish, toasted bread, eggs, chicken, pork tacos, a garnish for soup. Chimichurri may take the lead as my favorite condiment and push balsamic vinegar to second place. It’s beautifully simple and amazingly flavorful considering the base is parsley. Add some lemon, red wine vinegar, garlic and red pepper flakes and you have a flavor treasure. It doesn’t need much love. Mix it up – slather it on anything edible – watch the bowl empty. Finely chop the parsley, fresh oregano, and garlic (or process in a food processor several pulses). Place in a small bowl. Stir in the olive oil, vinegar, salt, pepper, and red pepper flakes. Adjust seasonings. Serve immediately or refrigerate. If chilled, return to room temperature before serving. Can keep for a day or two. Serves 4. Place the scallions, mint, dill, red pepper flakes, olive oil, and lemon juice in the bowl of a food processor fitted with the steel blade and puree until it’s a coarse paste. Add the yogurt, salt, and pepper and pulse until combined. Transfer to a bowl, cover, and refrigerate for a few hours to allow the flavors to develop. Prepare the sauces as instructed above and set aside. In a small bowl combine marinade ingredients: garlic, olive oil, salt, pepper and lemon juice. Rub over lamb chops and let sit on the counter for about 30 minutes. Heat a gas grill or grill pan over high heat. Add the chops and sear for about 2 minutes. Flip the chops over and cook for another 3 minutes for medium-rare and 3 1/2 minutes for medium. Every trip I take has “the list” and this list contains the essential places I want to eat. Most often the list is comprised of places well known by locals and cuisine I can’t get at home. I do my research as nothing is more disappointing, albeit to me, than suffering through a mediocre meal when a mouthwatering meal is two doors down. The infamous Patati Patata was at the top of my list of local favorites. It is SMALL with just two tables and one short counter. No one seems to mind and I wouldn’t change a thing. It’s also cheap – hard to spend $10 for food and a glass of the local St. Amboise beer on tap. I must admit I have a soft spot for this place after meeting a few of the master grillers the previous night at my favorite Montréal bar: Quai des Brumes. We shared some libations and they included me in their celebration of Mathieu’s upcoming voyage. As luck would have it I got an invite to dinner on the following night and witnessed his last call on his last shift after 7 years at the Patati. Mathieu’s loyal diners were in tow to wish him bon voyage. The food was better than good. It was fantastic. 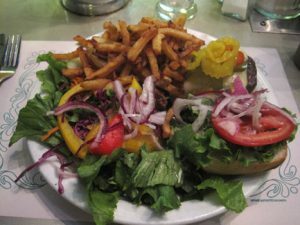 Burger, fries and salad seem to be a favorite and I was not disappointed. In fact, I went back the next night for more. On a tip from my lovely local I had the fish sandwich (done on the grill not fried) and more salad, which is the honest reason for my return. I became an addict for the salad dressing. Sundried tomato, balsamic and coriander is my favorite of the two very creative dressings they serve. Sour cream, basil & sesame oil being the other equally creative dressing. I’ve been home 1 week and have tried to recreate it twice. This last try was the closest I’ve come until I can get back to Montréal and sweet talk my remaining new friends at the Patati for the recipe. The secret is the coriander and I ground it fresh as I had coriander seeds waiting to be used for something special. Until I return to the Patati this will be my tasty reminder. Enjoy! In a food processor whiz the sundried tomatoes and garlic until fine. Do not puree – it needs to have some texture. Place the pulp in a jar or container you can store in the refrigerator when done. Next add the shallot and red bell pepper to the food processor and whiz until chopped very fine. Add to the jar with the balsamic vinegar, ground coriander, salt and pepper. Add the olive oil to the jar and shake to combine. Store in the refrigerator. This salad was inspired by a classic Nicoise Salad with its fresh anchovies, potatoes and green beans. Since my fish choices in the freezer were salmon or salmon I ended up here. If you do anything MAKE THE SALMON CAKES. They are perfect on their own and remind me nothing of the old canned salmon patties my mom made (sorry mom). I am also picturing these on a sandwich with a spicy rémoulade (think po’ boy). The dressing is compliments of my great friend Laura and is her signature dressing. I make this weekly and store it in the refrigerator so I alwasy have it near and ready for greens. 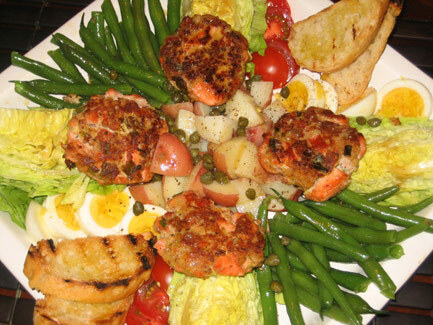 To make the salmon cakes stir together all ingredients (except olive oil) in a medium bowl. Form salmon mixture into 4 (3-inch) patties. Heat 1 tablespoon olive oil in a small nonstick skillet over medium heat until hot, then cook salmon cakes, carefully turning once, until golden and salmon is just cooked through, about 6 minutes total. Mix all ingredients for dressing in a small jar and close lid. Shake until combined. To assemble the salad, just before serving toss the beans with enough vinaigrette to fully moisten them. Arrange all pieces on a platter and drizzle with vinaigrette.